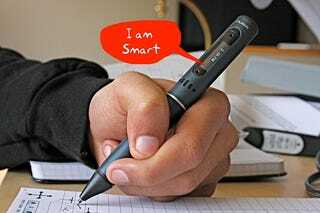 The Gadget: The Livescribe Pulse Digital Smartpen records your notes two ways: it creates digital copies of everything you write by hand while recording audio at the same time. It also goes one step further and links the two together, so you can quickly access audio by tapping parts of your notes. All of this is uploaded to your computer where the Livescribe software archives and makes your notes fully searchable. In addition, it offers features like a calculator, translator, and a paper piano that plays a mini piano you draw on paper. The Verdict: I like the Livescribe Pulse quite a bit. I think it performs as advertised and is relatively easy to use. That said, this doesn't offer anything enticing or groundbreaking for people who don't use a pen and paper on a regular basis. It's a product for the likes of students, journalists, or even doctors, who are constantly scribbling things down with a pen. Here's a quick rundown of the pros and cons of the Pulse. As a quick refresh, the Livescribe Pulse uses special dotted paper for spatial recognition to digitally replicate the notes. In one regard, this is good, because it doesn't require any secondary hardware. On the other hand, you cant just use any old piece of paper to make this thing fully functional. each sheet of paper has controls on the bottom, allowing navigation of the pens menu system, recording controls, bookmarking, playback controls, and speaker volume. The note-taking/digital recording/replay function works smoothly. You hit the record button on the paper before you begin to write, then as you jot down your handcrafted masterpiece, it simultaneously records the audio and keeps the two linked. When you stop recording, you can tap anywhere in the vicinity of your notes and it will playback the audio from that moment when you were writing. It's awesome. These can also be uploaded into Livescribe's Desktop software, which archives your notes according to the notebook they were written in and the page it was on. Text with audio linked to it appears in green, and when clicked, plays back the audio. There is also a search engine with handwriting recognition that works exceptionally well. I laid some chicken scratch on the page and it picked every word up, save for one word I couldn't even recognize. It doesn't currently support OS X right now, but they say its in the works. Many of the secondary functions are neat, but I don't know I would use any of them on a regular basis. The Paper Piano is novel. The written calculator seems semi-practical, when in the middle of note scribbling, but the printed material on the inside cover of notebooks just isn't that useful. There's another calculator, a visual keyboard (which isn't yet supported) and status buttons for time and date. Also strange is that the settings can only be adjusted by the interfaces printed on the inside covers of notebooks. There's no on-screen system for adjusting this using the cross-based navigation. The highly touted translator is also missing (though promised in the future), replaced with a demo that translates 20 words into Arabic, Mandarin, Spanish or Swedish. And one issue I had with the written calculator and translator was that I tend to write without picking up my pen between letters, and it couldn't recognize what I was writing. They say cursive support will come, but I'm not sure it will fix the recognition for people with poor handwriting. The build quality of the pen is good, with a metal exterior that doesn't feel too light or heavy in the hand. It has an OLED screen that brightly displays pertinent info, stereo microphone, a loud speaker, and a magnetic dock/data connector. However, it's closer in size to a magnetic marker than a pen, and you have to hold the pen relatively high so as not to block the sensor. This feels a little cumbersome in the hand, but you mostly get used to it. Mostly.